Cancellation before 2 weeks prior to arrival will not be charged. All after will be charge in the amount of 100 percent for the first night amount (No show). 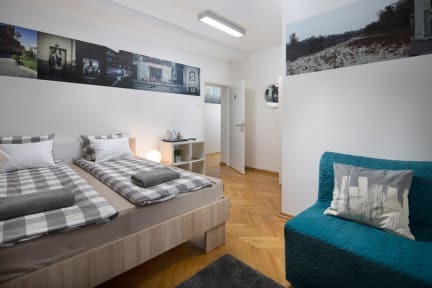 The hostel is located in a very centre of the imaginative and playful Zagreb. We are only three minutes away walking from Zagreb's main, Ban Jelačić square, but still in a quiet and peaceful yard isolated from traffic noise. A newly-renovated, modern designed hostel with full service operating 24/7 allows you to relax and rest as well as to have fun. You can book your staying in specially designed double, triple, quadruple, five, six and eight-bed rooms and private ensuite rooms. Each room has a locker with the key, air condition and Wi-fi access. The whole hostel is a gallery with photographs of a young artists from all over the world. We are not party hostel but we always encourage our guests to meet other travelers and have fun in our spacious common rooms in basement. Everything was great, friendly staff, cozy beds and dorms, lockers, good showers. The location is also very good, not even 3min walking from the main square. The hostel is very well kept and the wifi was also good. Even for luggage storage they have lockers and it’s for free, great. We were very happy and would stay here again. Great value for money! Overall great experience. I stayed for only one night but everything was fine. Recommended. Everyone was great! Very comfortable bed as well! Great hostel. Clean, quiet and the location is perfect. The kitchen was under renovation, but other than that no complaints. Nice clean place to stay, good location accessible to the centre and major sights and good restaurants. Good night's sleep. Comfortable hostel with big suitcase lockers, lights and PowerPoints at beds, good hot water. The worst part was the fluorescent lighting really, I know that’s petty (and also it’s part of the office block theme so I understand) but it really is so uncomfortable and it made me not want to use any of the communal areas at all. The other thing was that the kitchen for guests is upstairs from the communal space and is tiny so you can’t share a meal with new friends. Make things cosier!! !